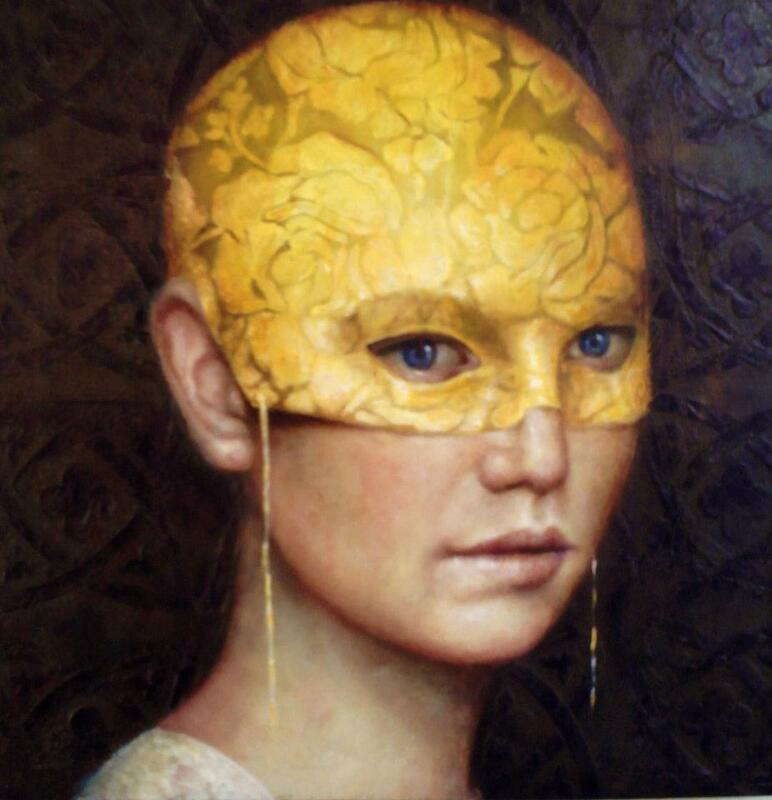 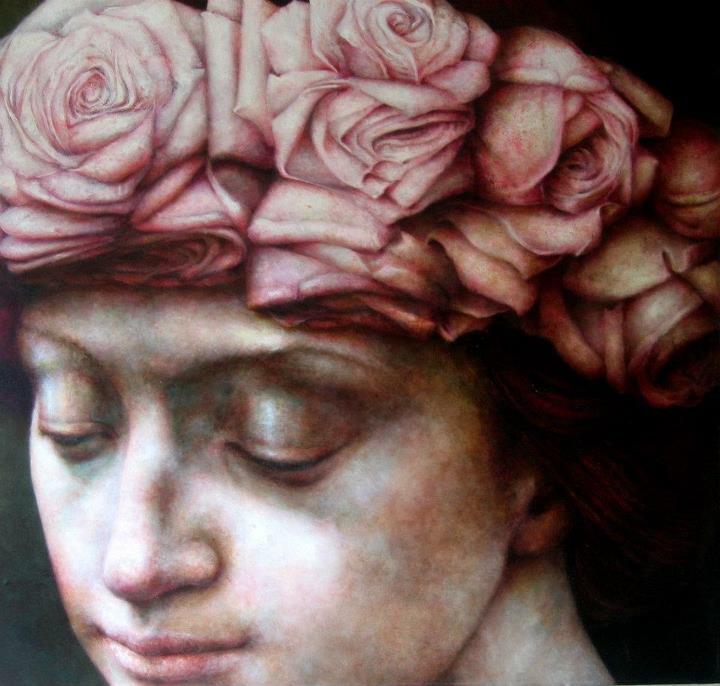 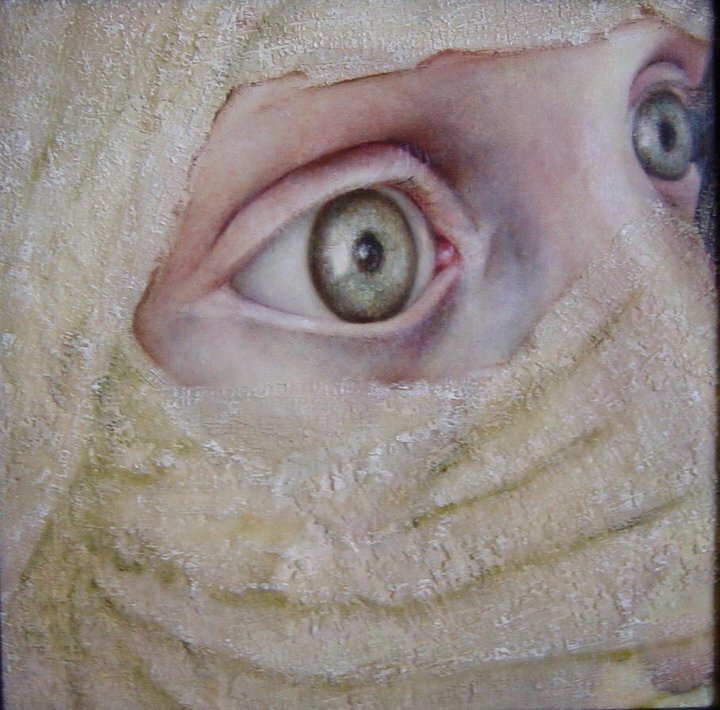 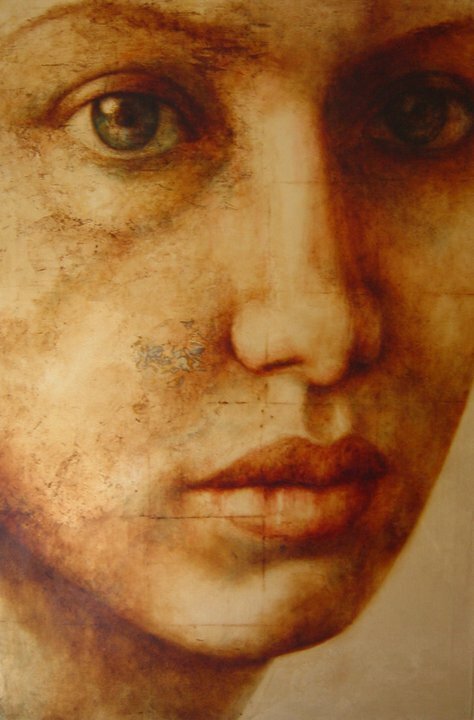 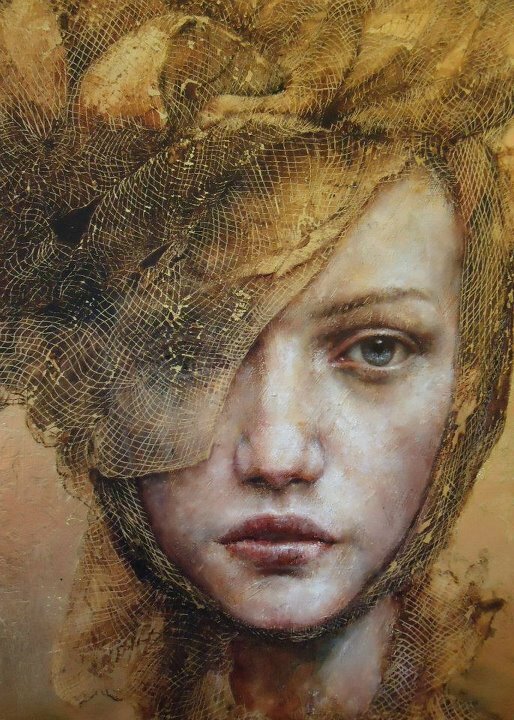 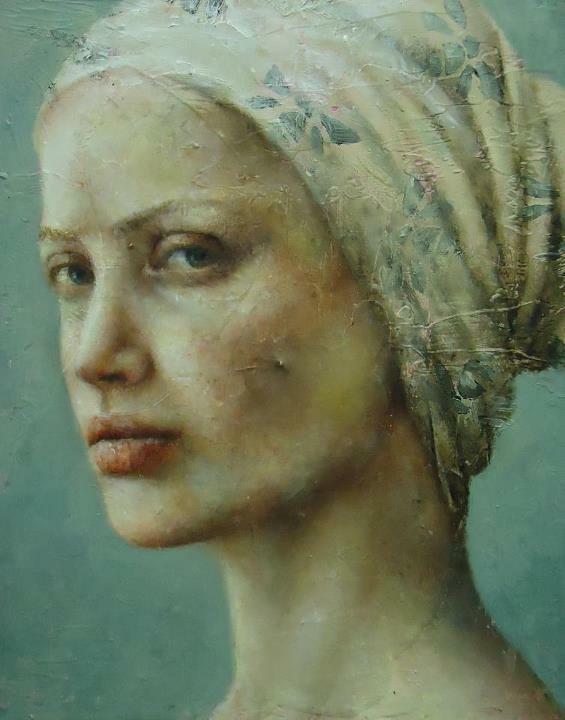 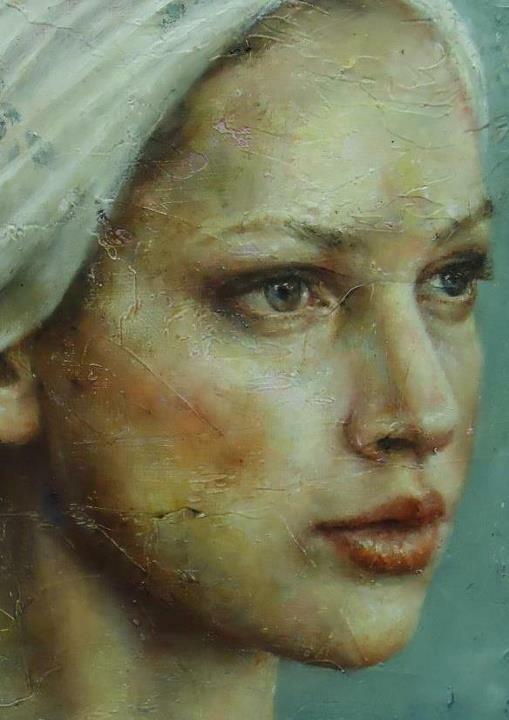 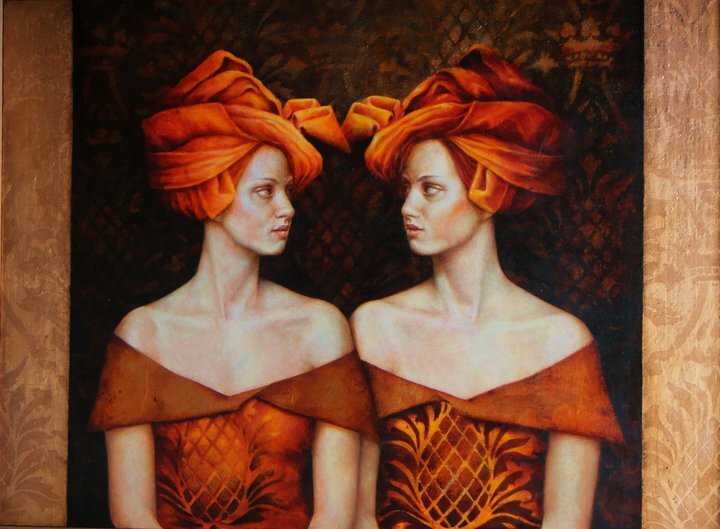 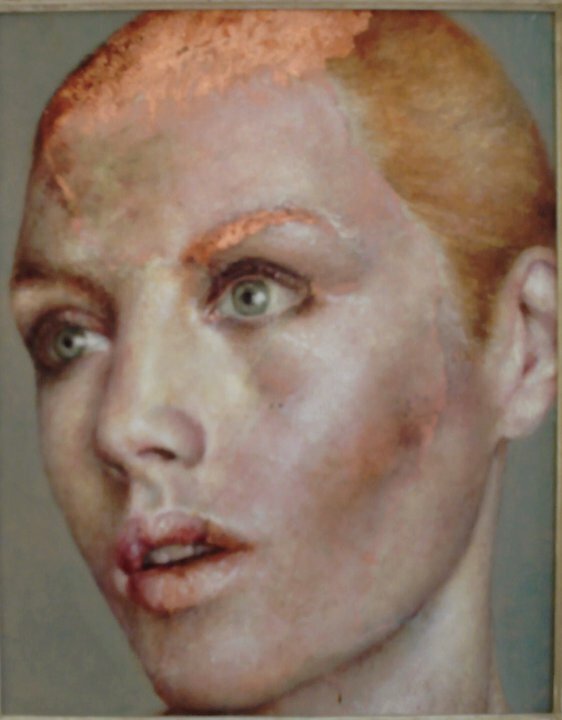 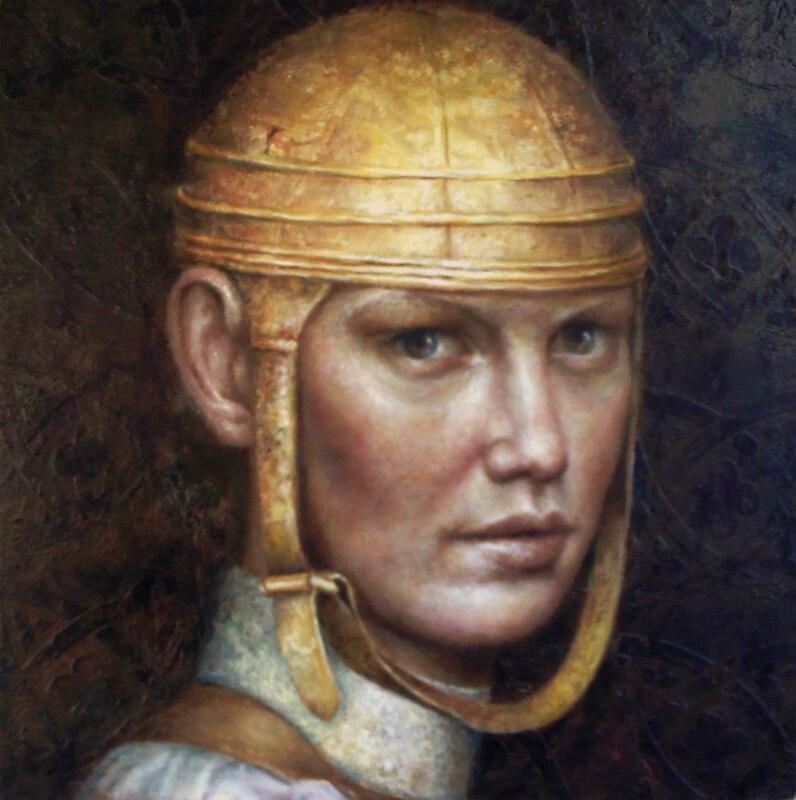 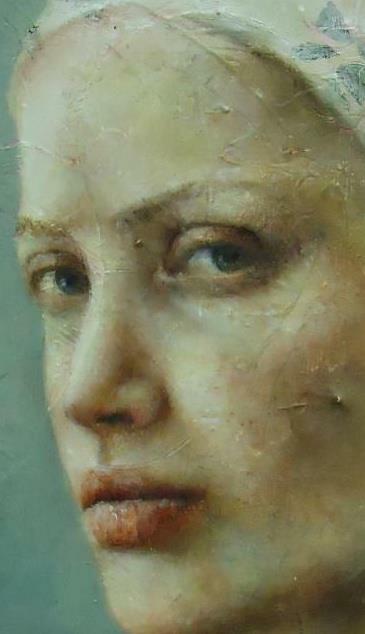 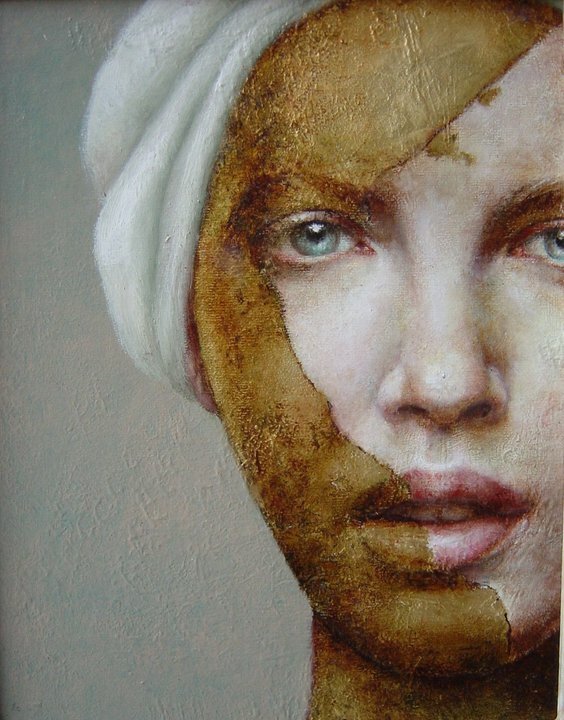 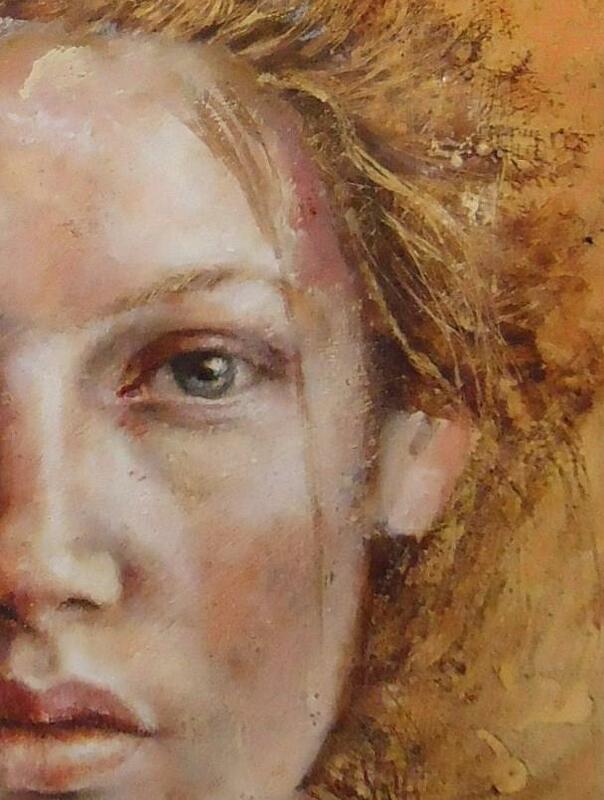 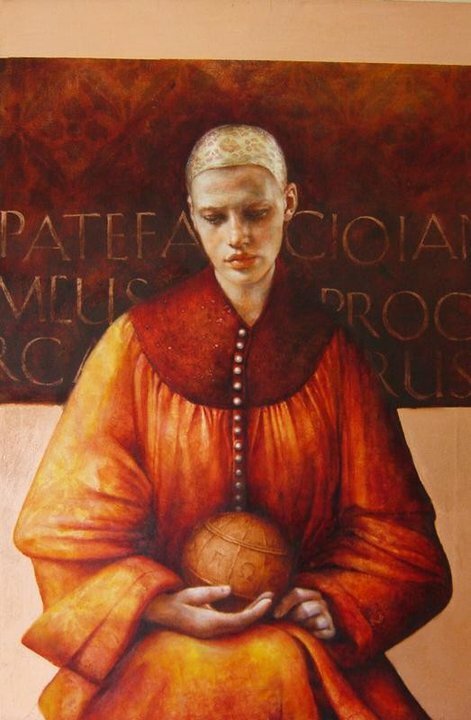 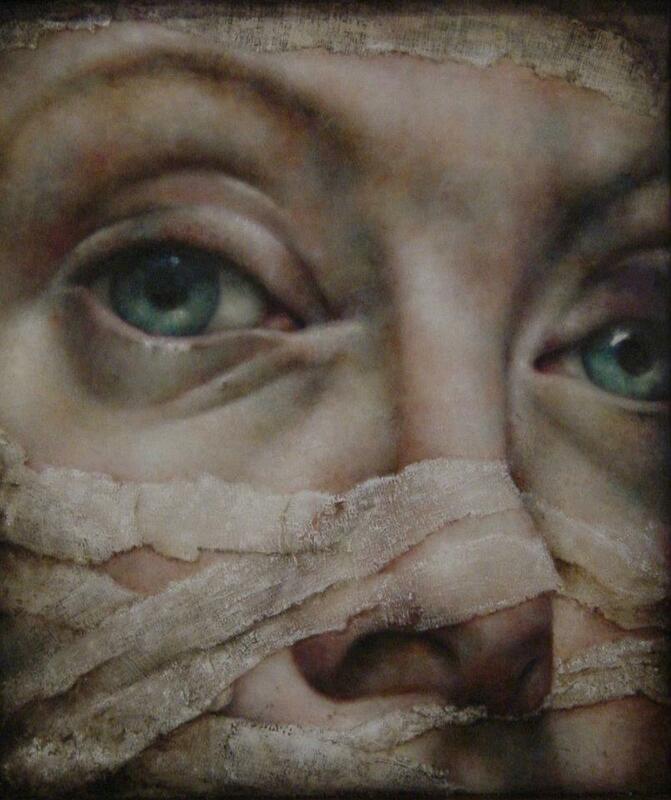 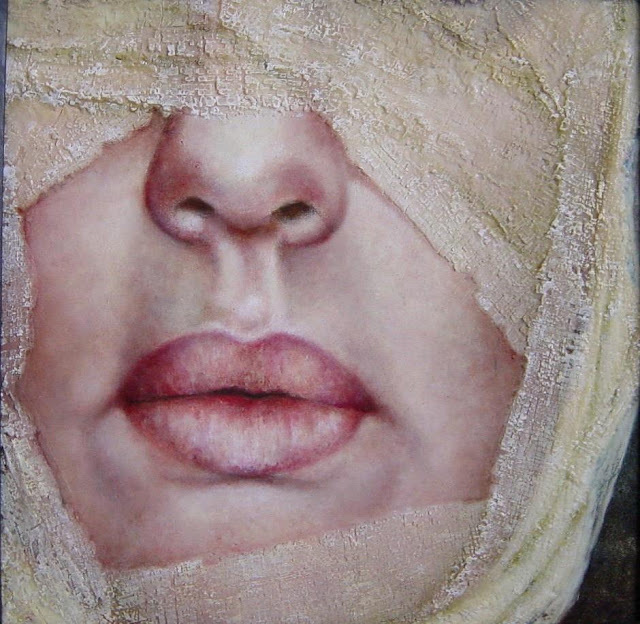 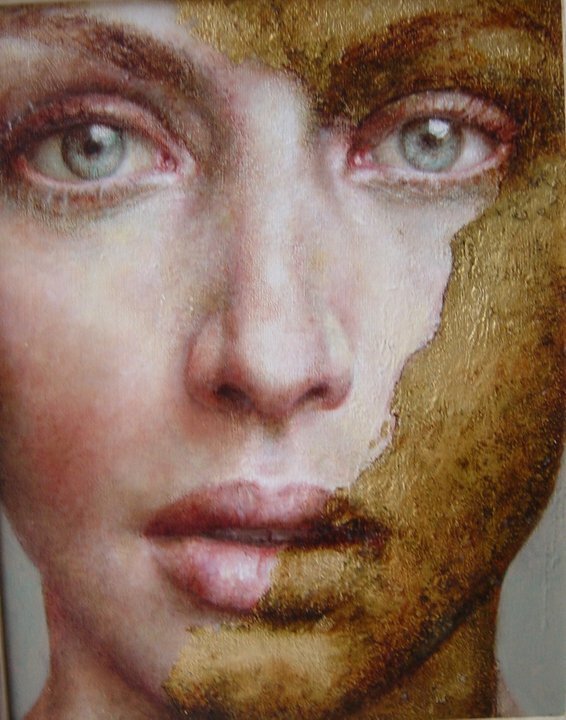 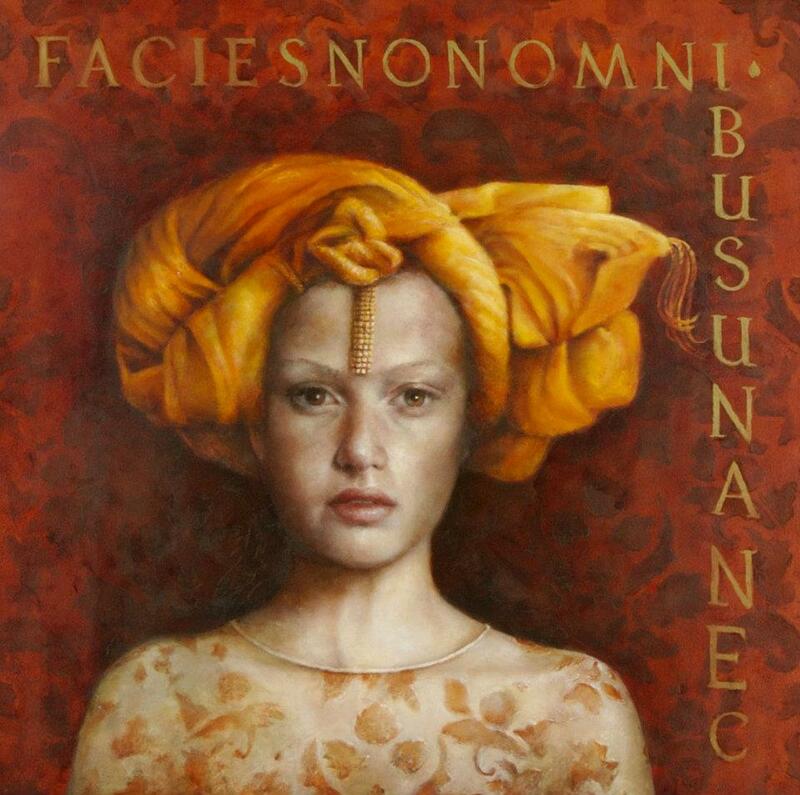 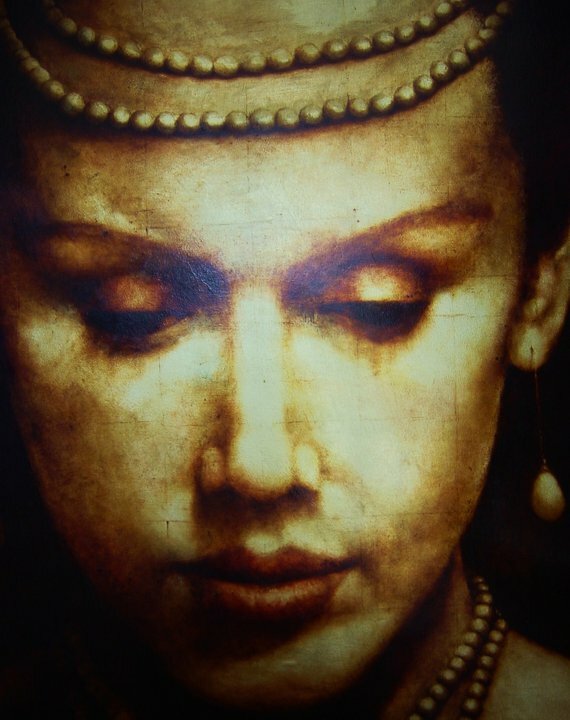 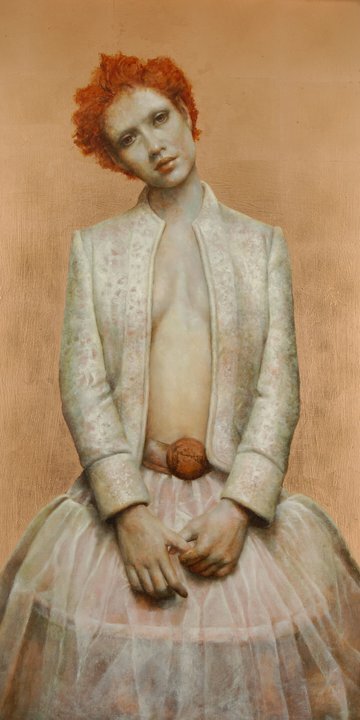 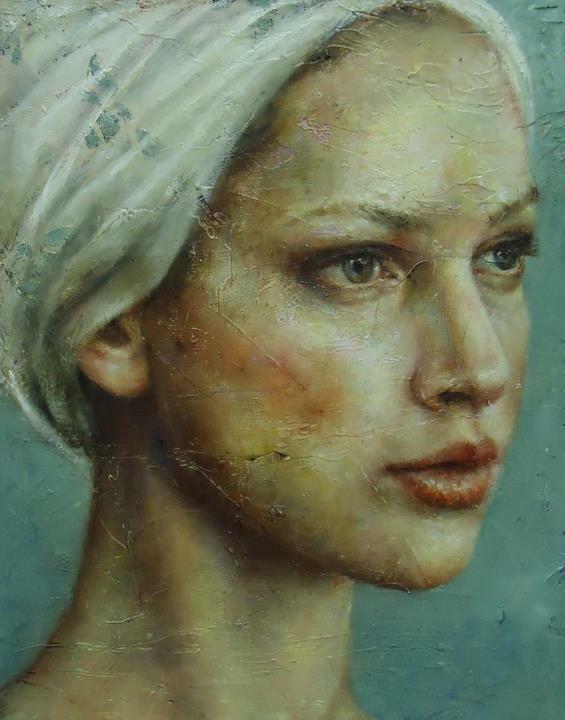 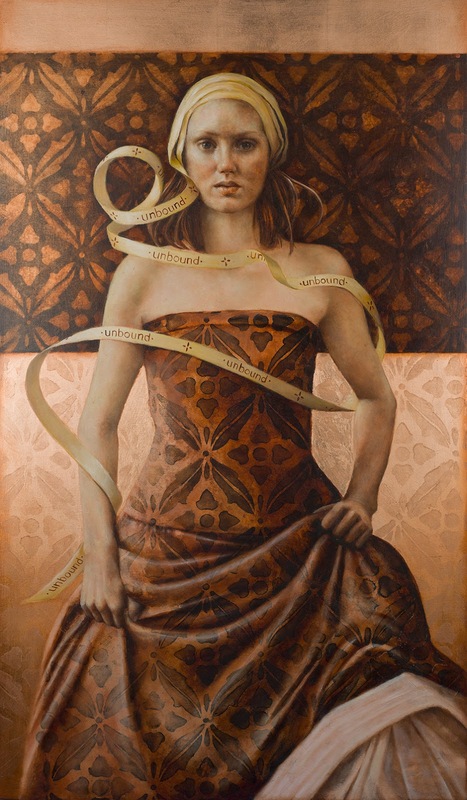 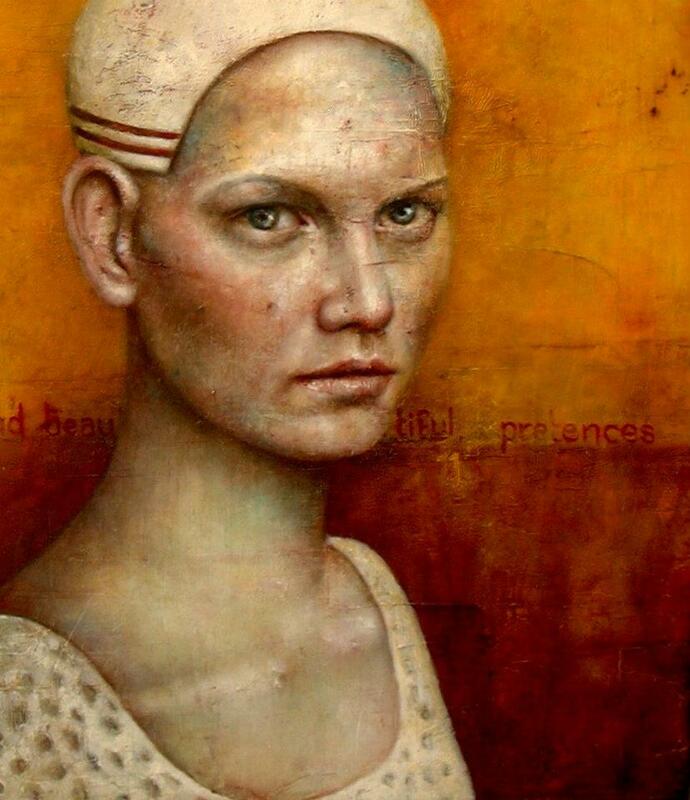 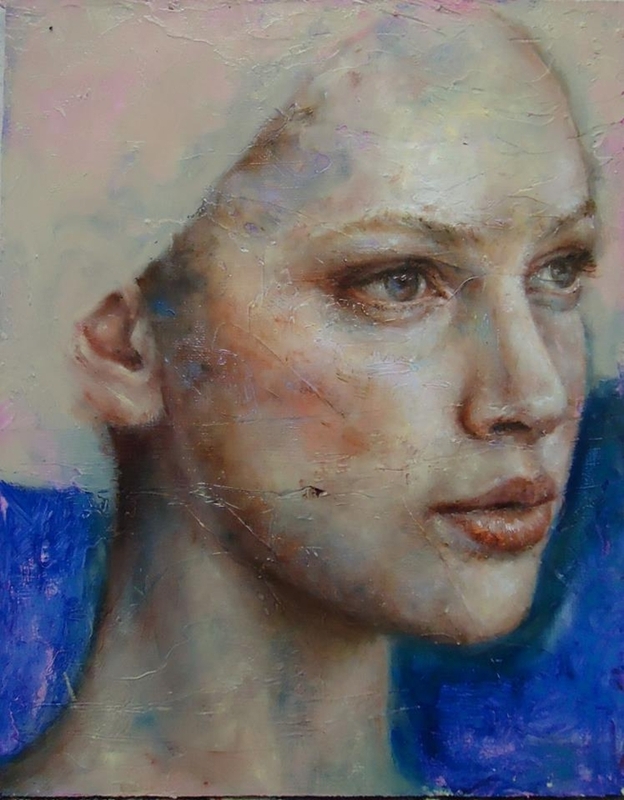 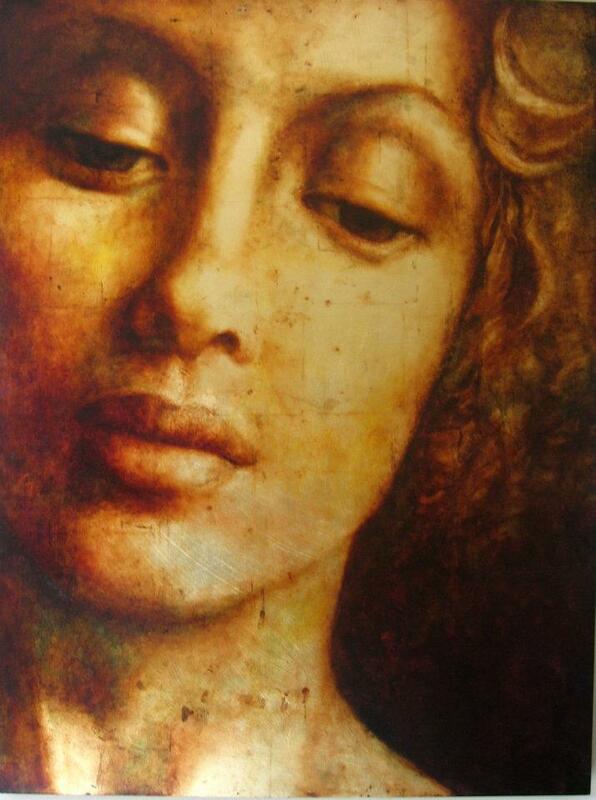 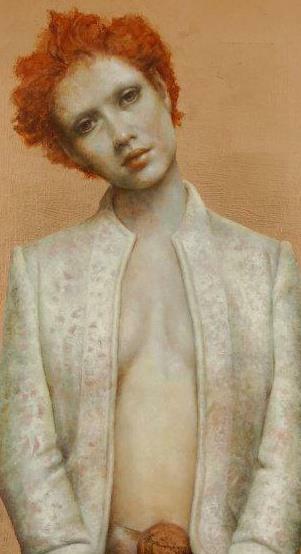 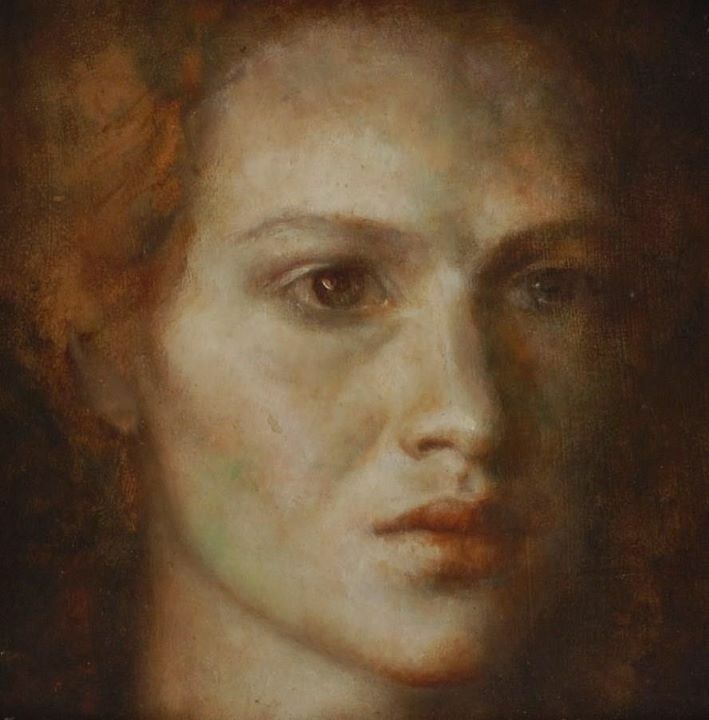 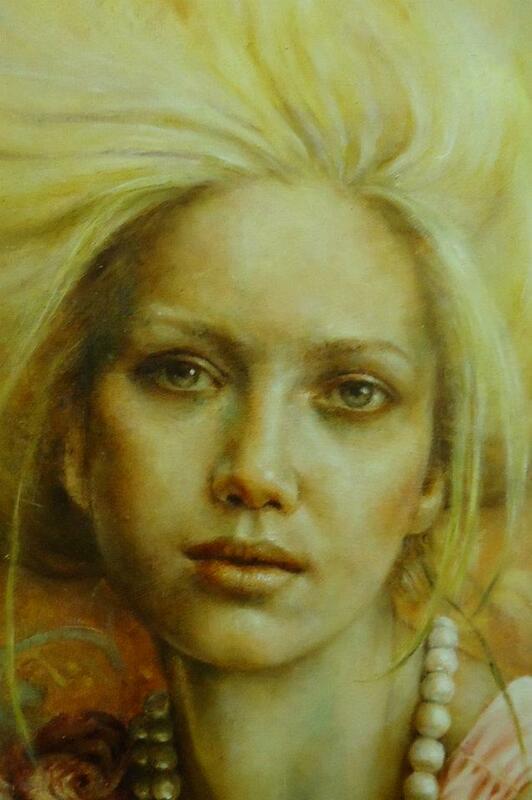 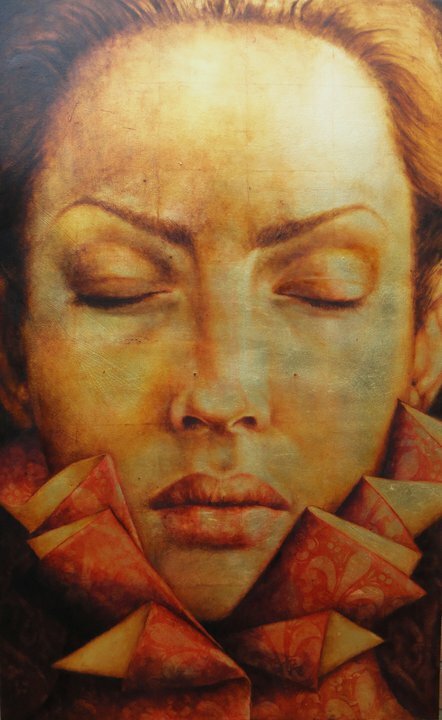 Pam Hawkes is preoccupied with a certain epic female quality. 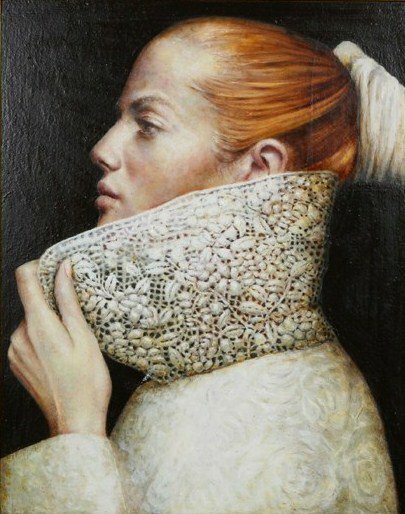 But if anything, her work seeks inspiration from even further back in history – past the roaring 20s and the renaissance to a time when Europe was just beginning to wake up from 1,000 year dark age. 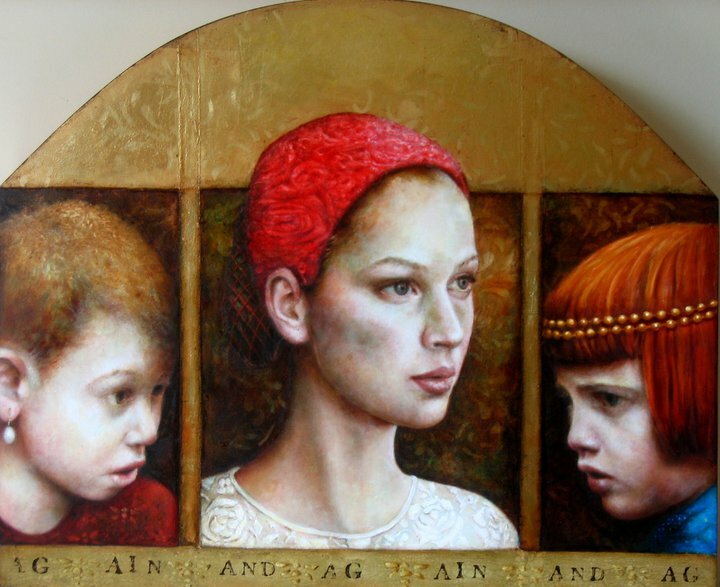 The work has been called Modern Gothic – to Pam's approval – and it's easy to see why. 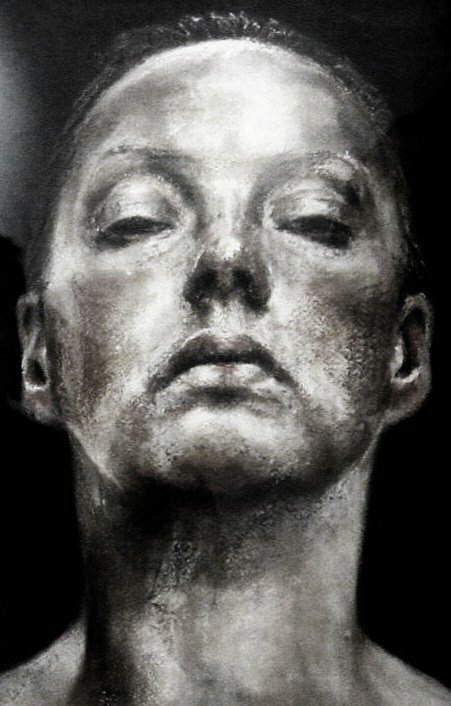 Pam is based in the Midlands and has an MA from the University of Central England. 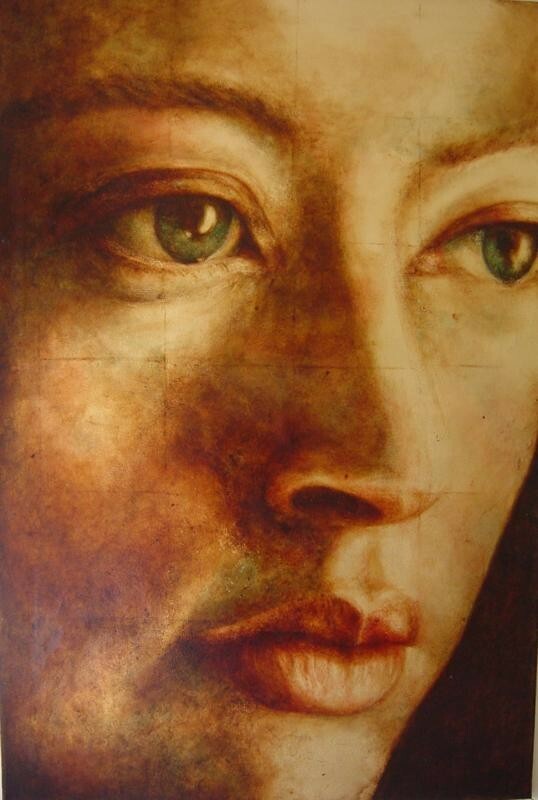 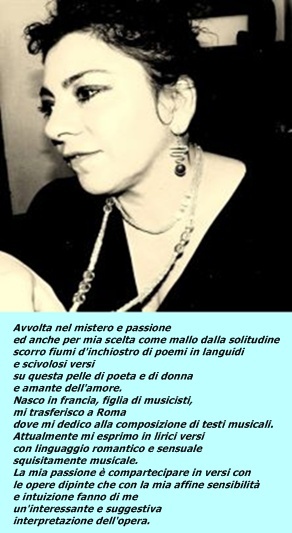 She has also lectured in fine art and life drawing at at schools and universities across the region. 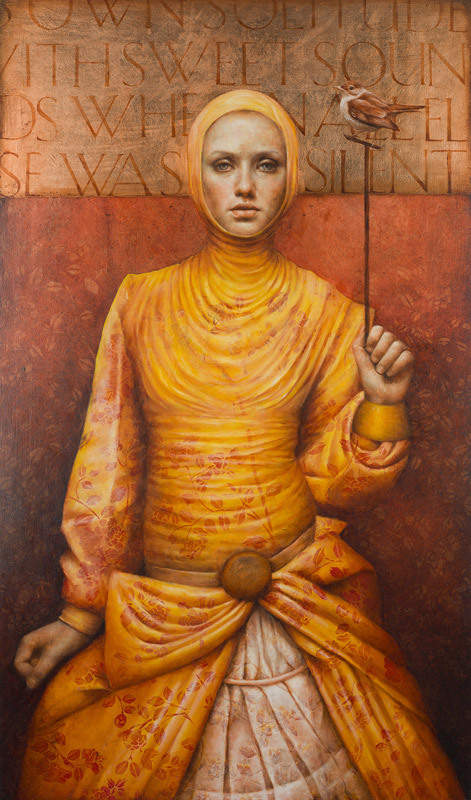 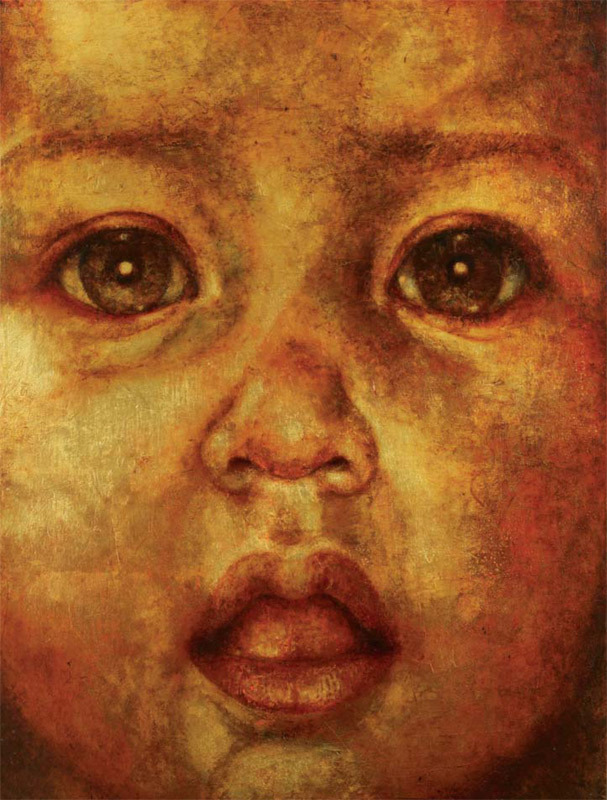 At first glance her paintings recall the religious icons of the Byzantine era, with their golden colour schemes, classically posed subjects and unusual framing devices. 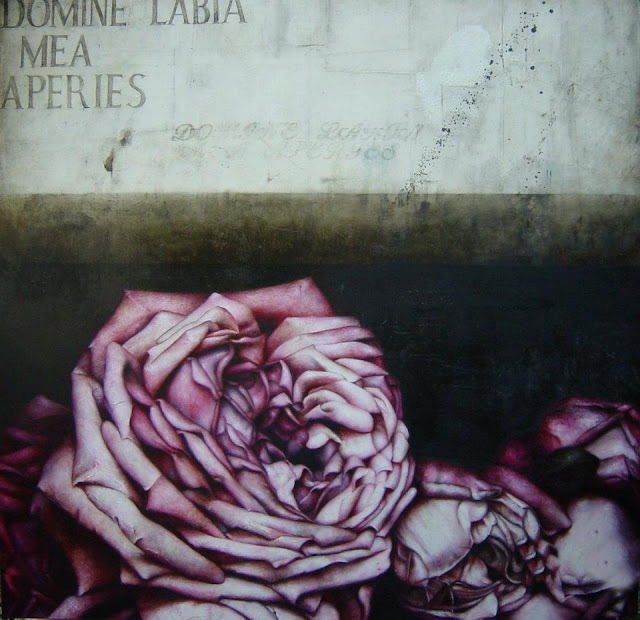 Milles Fleurs is a fine example of this. 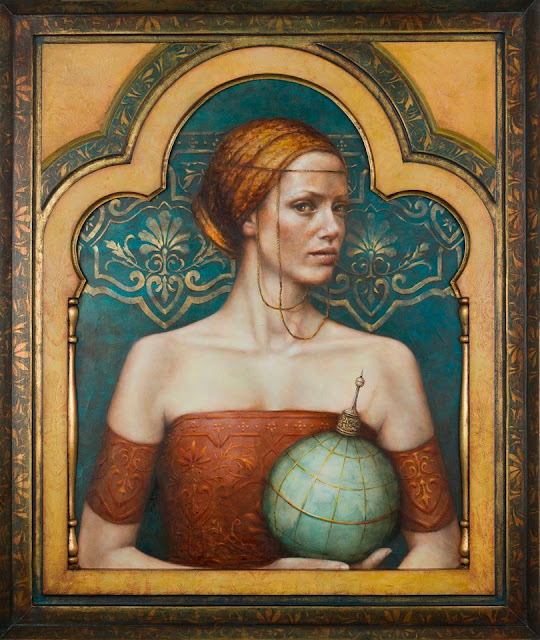 So is Terra Incognita. 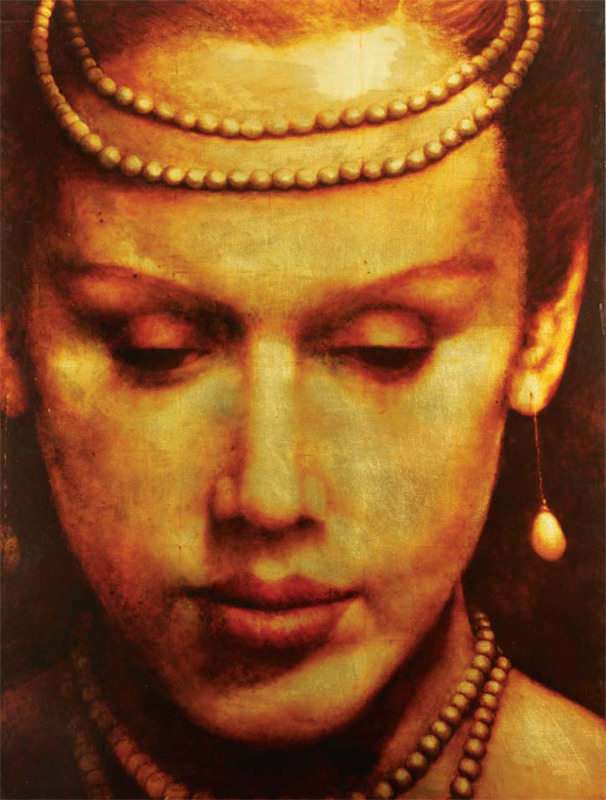 With its shimmering metallic hue and carved tripyych-like frame, this could have been 'reclaimed' from a church somewhere in ancient Turkey. 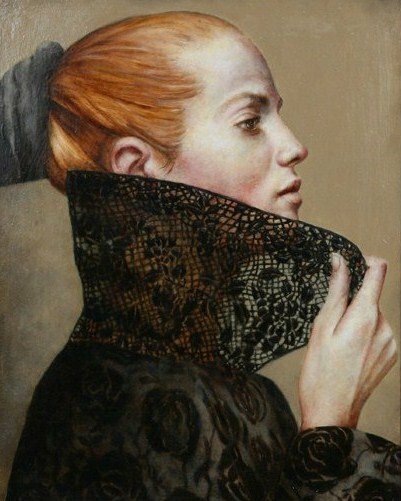 That said, it remains a defiantly modern work, like all of Pam's, thanks to the piercing contemporary gaze of the woman depicted. 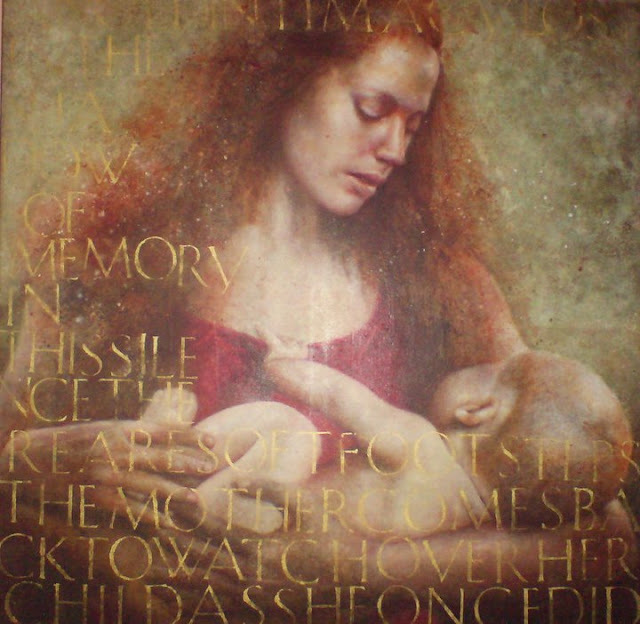 As before, Pam stirs up the melting pot with the addition of text in some of her paintings – Night Music for example. Don't go looking for explicit meaning here. 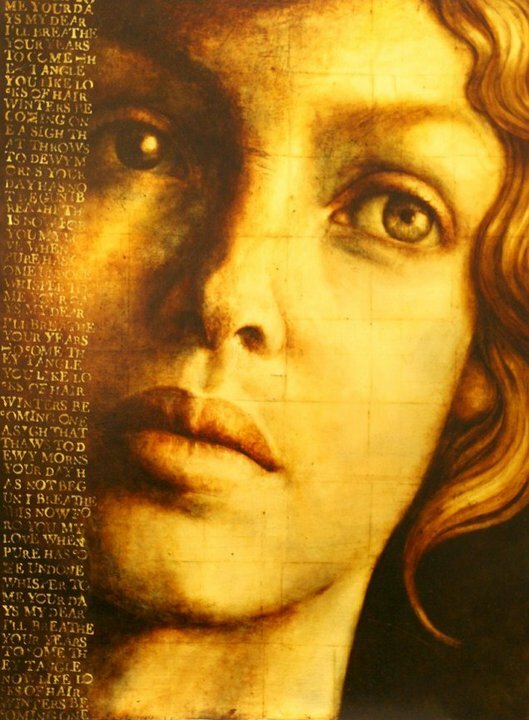 Pam cheerfully admits to drawing on published texts for her words, and uses them as inspiration, but the chief purpose of the script is visual. In Night Music, the words maintain the wonderful symmetry of the piece, helping to divide it into three nicely balanced components balanced by the belt in the lower third. 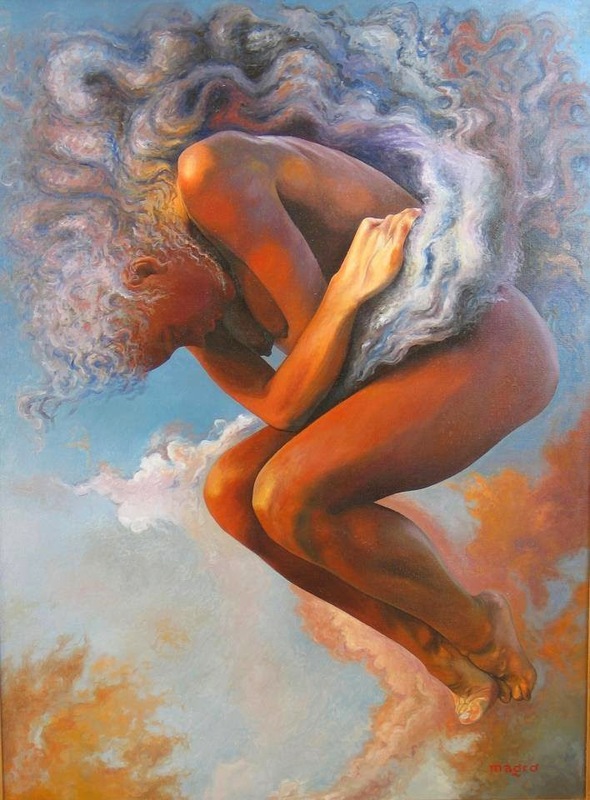 Unbound is similarly harmonious, and the effect is extremely pleasing. 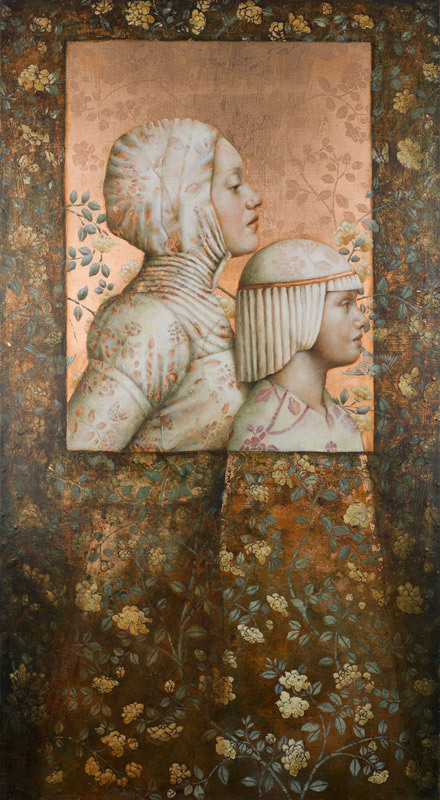 The latter painting also showcase's Pam's interest in decorative patterns. 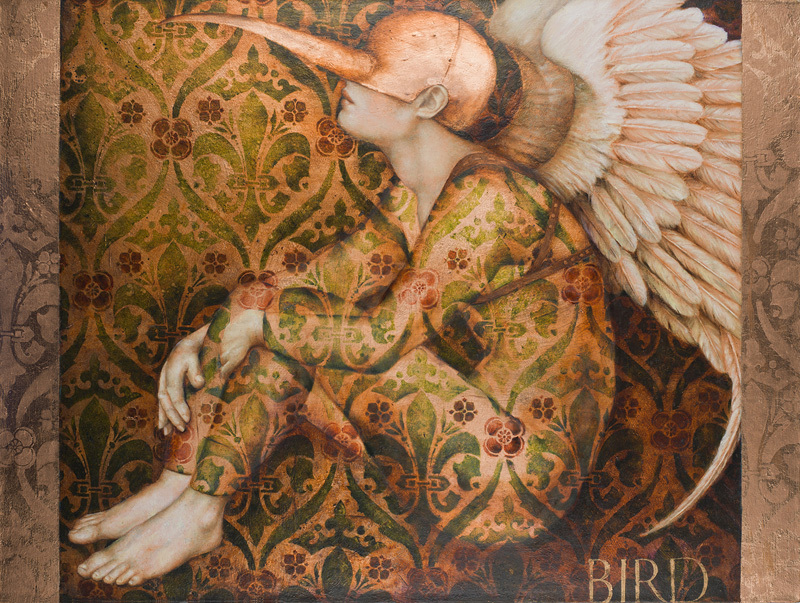 And this really comes to the fore in Bird, where the deliberate lack of perspective in the floral motif serves to flatten the image. 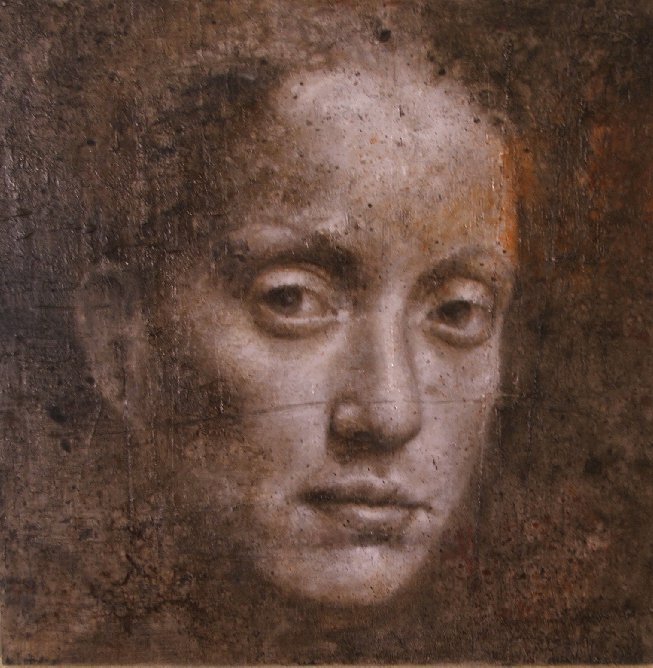 Interestingly, this echoes those old pre-renaissance days (when artists couldn't 'do' perspective) and the birth of modernism (when they knew how, but chose not to). 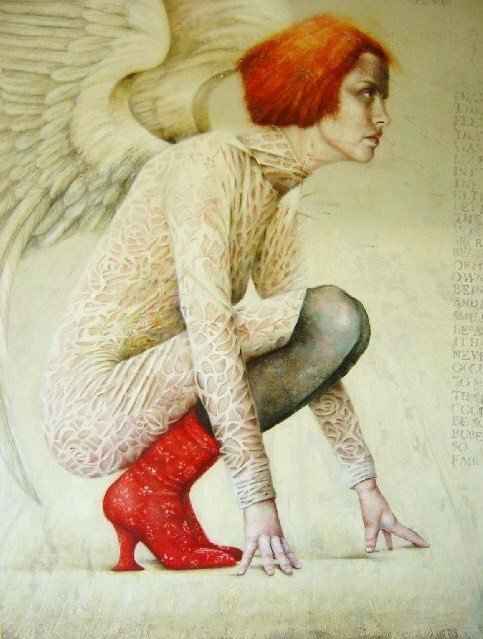 Either way, what with the flattening effect and that bird costume, it's just delightfully weird. 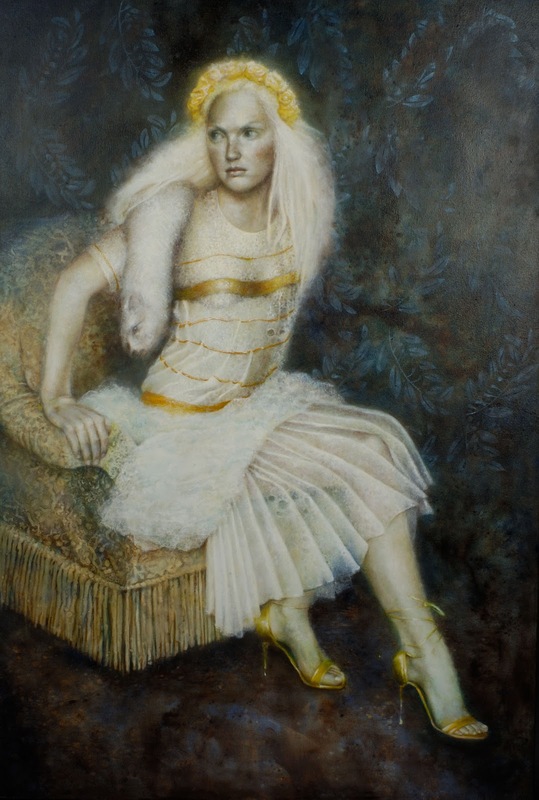 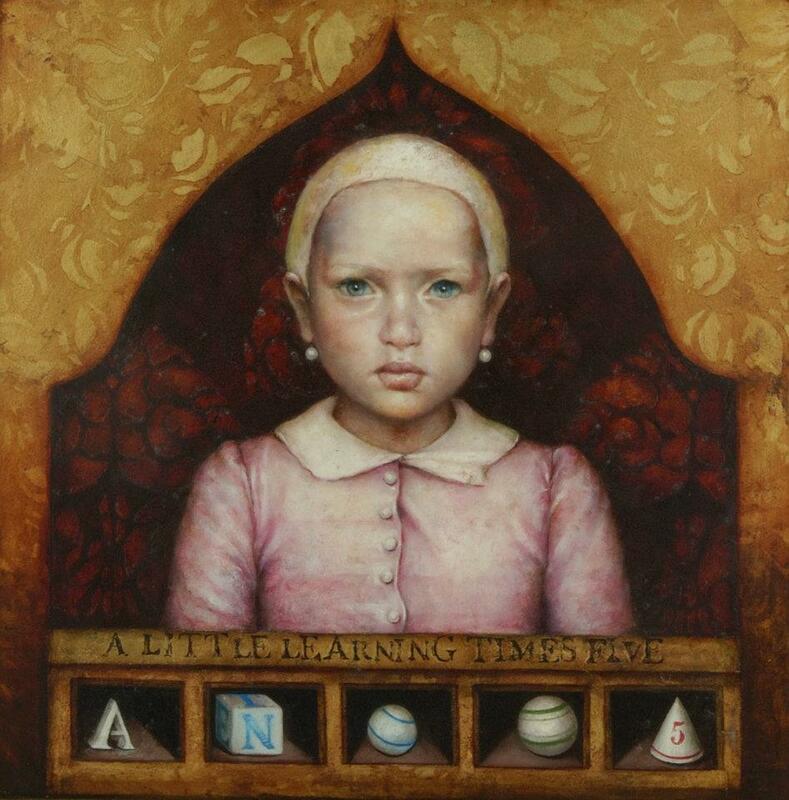 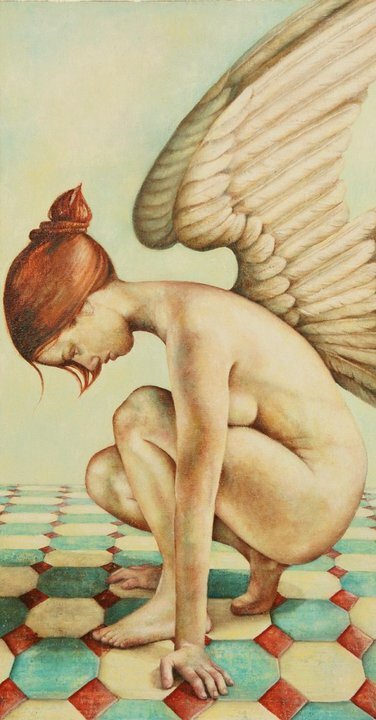 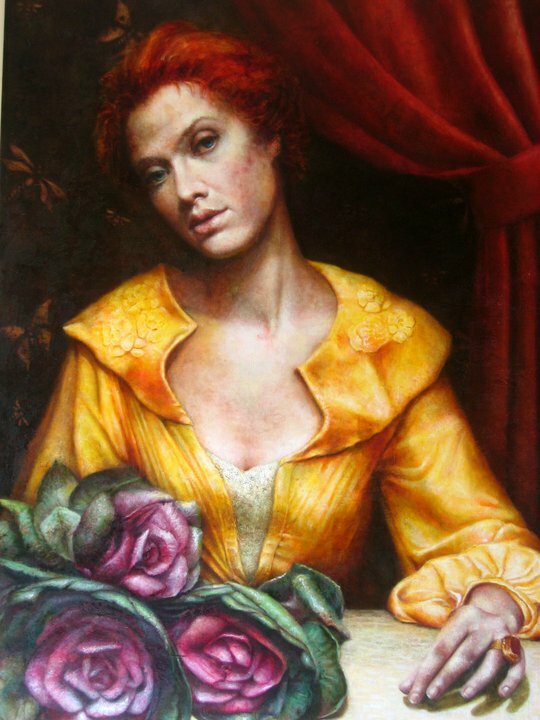 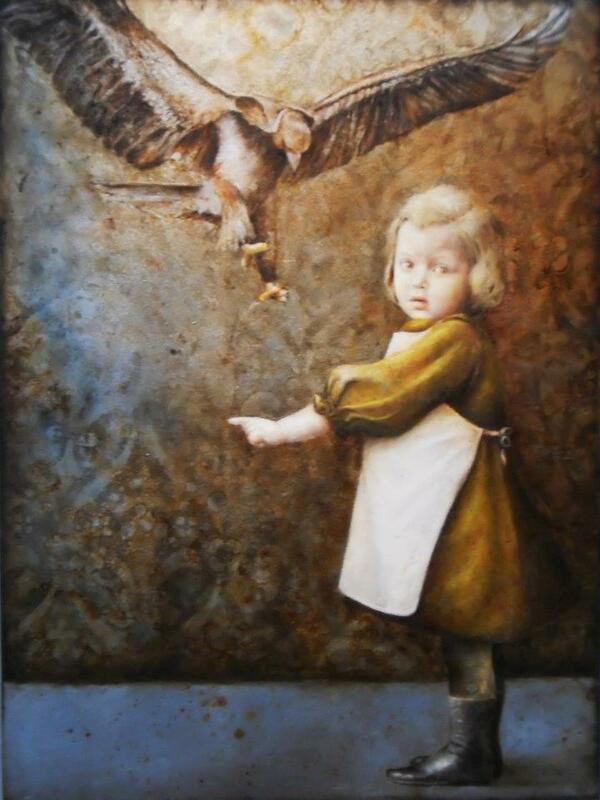 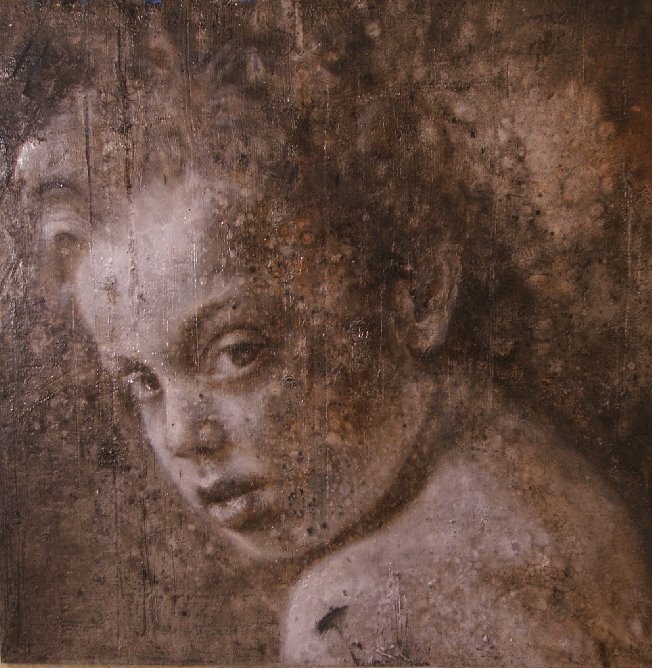 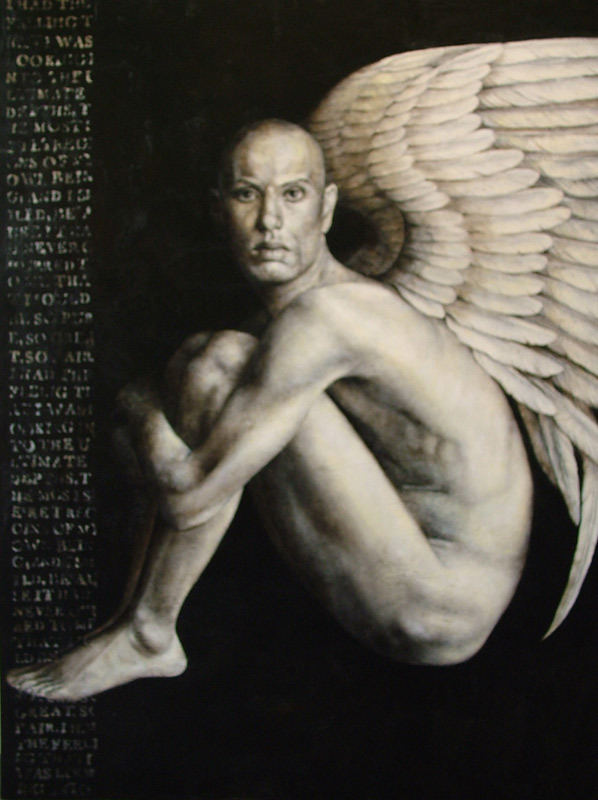 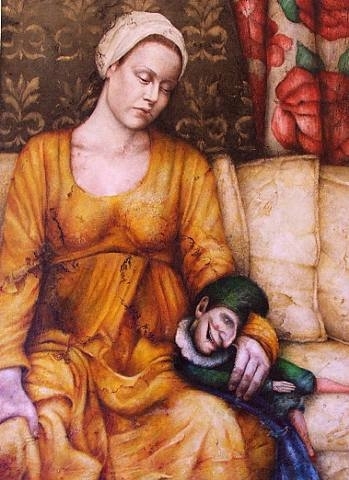 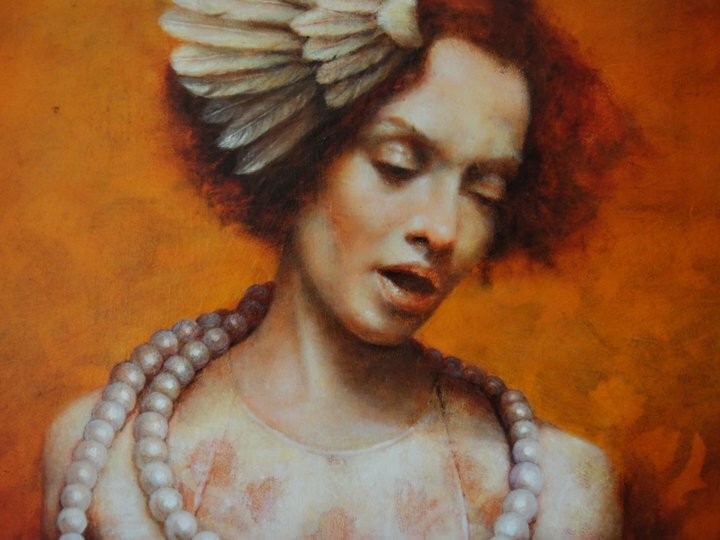 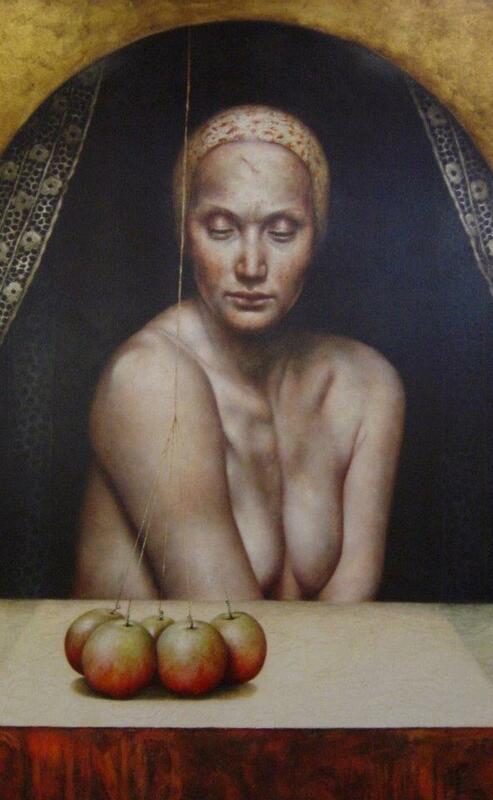 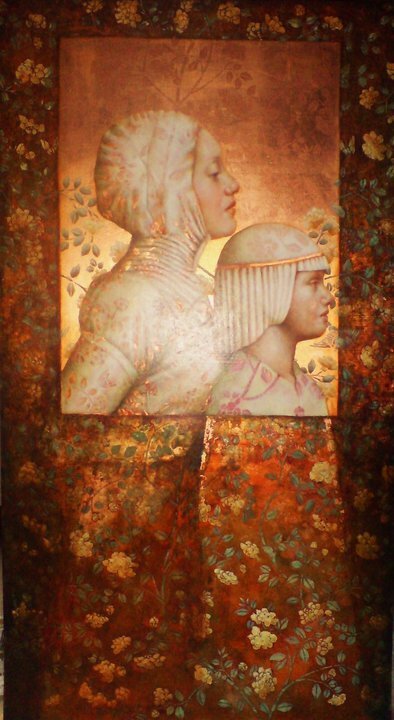 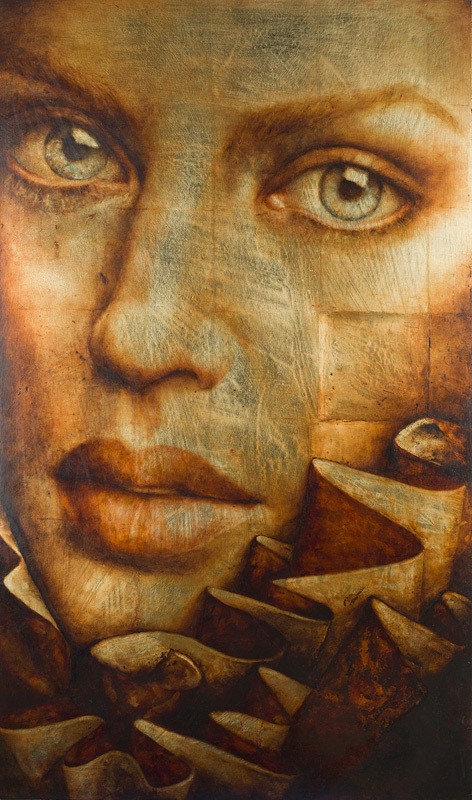 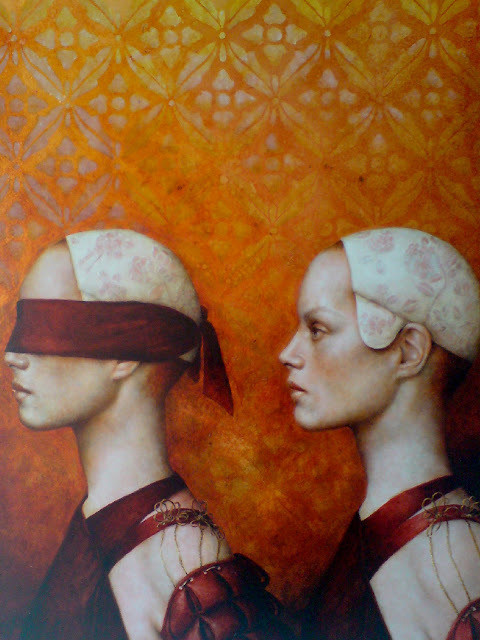 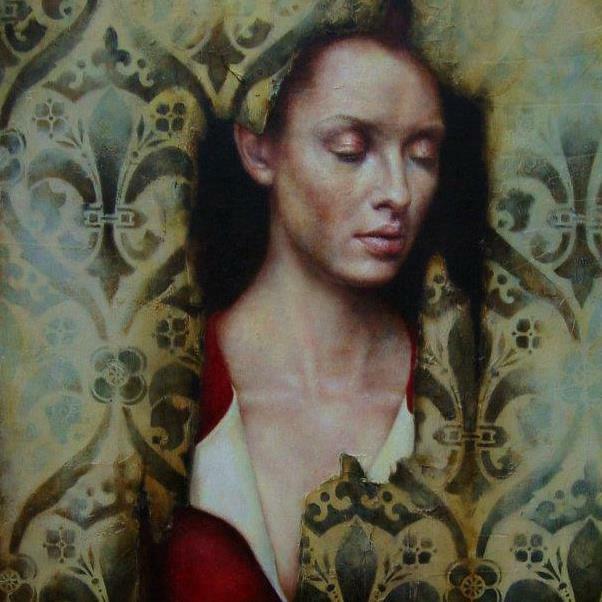 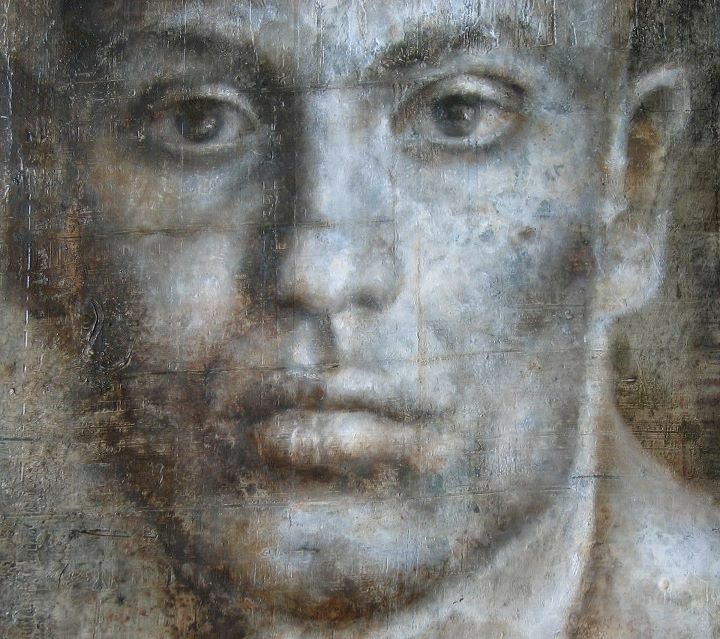 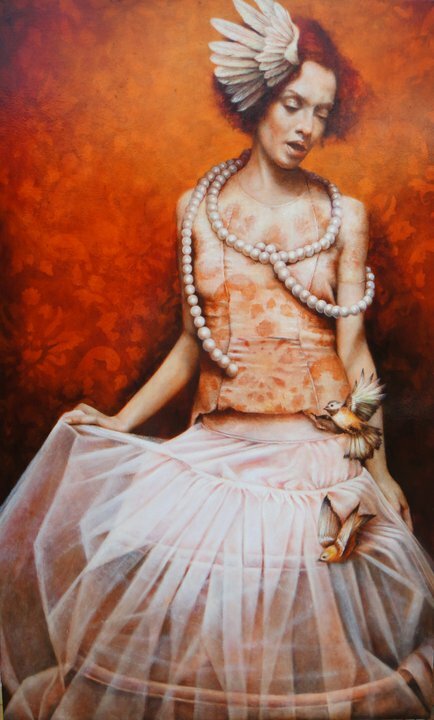 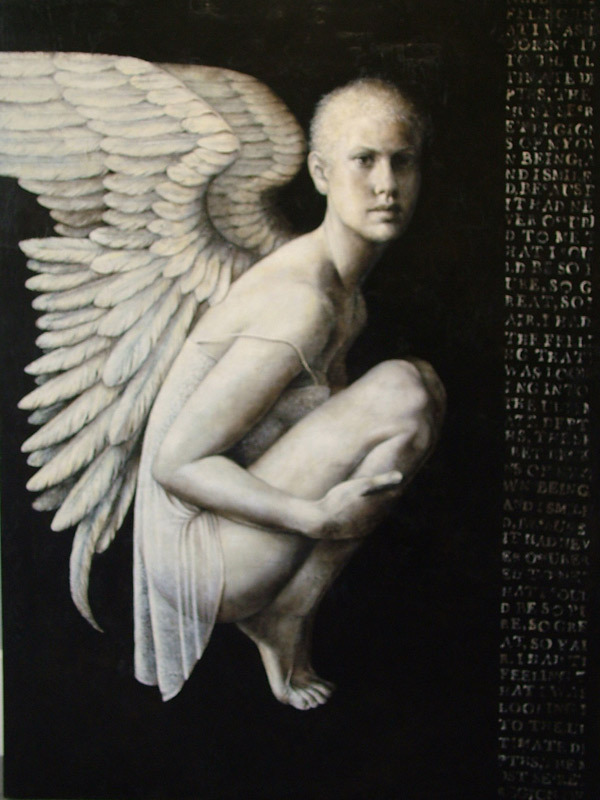 Bird could only have come from the imagination of Pam Hawkes, one of the true originals in the Catto family.